Dread is a game of horror and suspense. Those who play will participate in a mutual telling of an original macabre tale. You will take on the role of someone trapped in a story that is only as compelling as it is hostile—someone who will find themselves making decisions we hope never to face in real life. This roleplaying game uses Jenga® instead of dice. Pull from the tower and you succeed. Refuse to pull and you fail. The choice is yours. But if the tower falls . 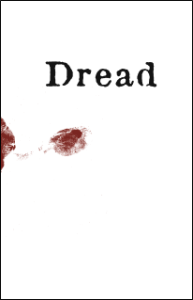 . .
Buy Dread: Available as a printed book and as a PDF. Pulp-style superheroes in an alternate Renaissance. Four Colors Al Fresco is currently in development. Watch for a Kickstarter announcement on our News and Events page. Play-test versions of this game are available. The Rumel: Canopy-dwelling monkey-like beings with a culture composed of Byzantine politics and powerful superstitions. The Anaugi: An amphibious race of crafter-sorcerers who endeavor to shape and reshape the very nature of reality. What happens at first contact with the other race? How will you explore and share your world?